You may have heard that under federal law, you are entitled to receive a free annual credit report from each of the big three credit reporting companies. So you're probably wondering, "Where can I get a free credit report?" The best way to get your free credit report is to follow this link to the Federal Trade Commission site. On that page, you'll find a link to annualcreditreport.com, the officially authorized site, approved by the federal government and sponsored by the three credit reporting companies listed below. This is a totally free credit report. Because it is linked from the FTC site, and is officially approved by the federal government, many people mistakenly believe it is a "free government credit report," but it is not prepared by the government at all. There are three major credit reporting companies (we give you their addresses below), and by using the links above, you can get all three credit reports free. You can order a free report each year from all three at once, or order one every four months to keep tabs on your credit all year long. By using the officially-sanctioned site, and linking to it directly from the Federal Trade Commission site, you can be sure your personal information is secure. This is important, because there are many copycat sites and similar-sounding website names. Some of them offer you a "free" credit report with score, but in order to get it, they require you to sign up for their credit monitoring service (with a recurring monthly fee), which most people simply don't need. You can monitor it yourself (for free) using the links we give you. For your security, be sure to link through the FTC site or go directly to annnualcreditreport.com using this link. If you're not comfortable accessing your free credit report online, you may also request it by phone, by calling 1-877-322-8228. There is a verification process, and your reports will be mailed within 15 days. Should I Order All Three at Once? You are entitled to one free report each year from each of the three agencies. You can order them all at once if you like, so that you can compare the information contained on them. Most likely, it will vary slightly. This is a good idea if you are about to make a major purchase, like a home or car. Or, you can order one every four months, and keep an ongoing watch on your credit report to see what changes have been made, or additional information added since the previous report. If you wanted to do that, you could order the free Experian credit report in January, the Equifax free credit report in May, and the free TransUnion credit report in September. That would essentially allow you to keep tabs on your credit all year round, for free. 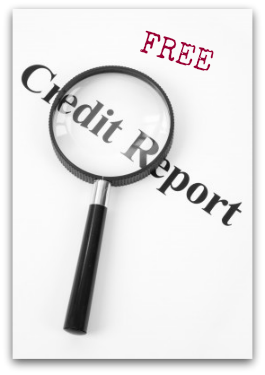 Unfortunately, the free credit report does not include your credit score (also known as a FICO score), which you must purchase. When you order your free annual credit report through the web site above, you will have the option to purchase your credit score at that time, or you may contact the agencies directly to purchase your credit score. Be sure you keep track of the information showing on your credit report, to make sure it's accurate. A large percentage of information on credit reports is not. If you find incorrect information, you can and should challenge it.